Posy arrangement for a funeral all ivory roses with mixed foliages. 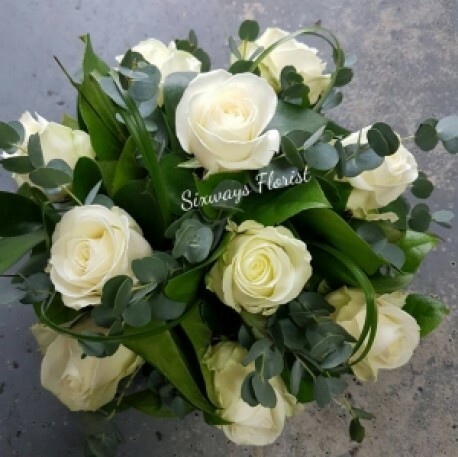 Stunning large headed roses with mixed foliage this round design is meant for a funeral but could be also suitable for sympathy flowers to the house but please state in comment box if that's the case as then will be wrapped in cellophane. We generally need 3-5 days notice for funeral tributes, please telephone us if you'd like to discuss in person any special requirements. or any perfered flower varieties or colours. We deliver to all local funeral directors in Cross Hands, Pontyberem, Llandeilo, Llanelli, Pontarddulais and Carmarthen, please add the time of the funeral if known if not we can liaise with funeral director to arrange delivery. Delivery to residential address is not recommended as this can cause extra work for bereaved family so only usually done on the families request.